-13 different people attended different parts of the event throughout the day. -We all ended up with 100 miles regardless of which way was taken. Thanks to everyone that came out to ride. It was a blast! Ride Time: 6:00am. Meet at the Park Ranger's building in Hickory Hills County Park north of Dysart, IA. Come to this point ready to ride. Parking: Those not planning on camping can drive in to Hickory Hills park. Go past the Park Ranger's building which will be on your right. Do not turn at this point to the left. Go down a hill a bit, and take the very next left. This will take you to a clearing. You can park to your immediate right, down near the water, or go forward and park in the boat landing area just past the gazebo on your right. Camping: Those coming to camp tonight, or staying Saturday night can make an immediate left at the Park Ranger's building on to a little boulevard. Then just follow the one way road around to the left until you see a gravel road going up the hill marked "Cabins, Shower House". (There is some construction work going on right here.) Follow this to the top where you can park your car. The top of the hill is all for tent campers and I will be in this area camping. There is a fee to camp in Hickory Hills, and I ask that you please pay accordingly. Cue Sheets: Print your own off the link here. After The Ride: Generally, the drinking and frivolity happened the night before past GTDRI's, but I'm not doing that again! This time, I plan on having some "adult beverages" afterward. We could go to LaPorte City, about 8 miles away, for some grub if we wanted to as well. At any rate, I will be camping whether anyone else does or not. So, it is up to you. Sunday in the morning I will pull up stakes and bug out, as I need to be back in town by 10AM. For Everyone Else: Obviously, most folks reading this will not be in attendance, but I do plan on posting about it, and perhaps an audio-blog or two might pop up here Saturday. Might be worth listening to......might not! I saw our Raleigh 2012 catalog the other day and this "Twin Six" frame was in there. I shot the T-6 guys an e-mail and asked if this was for real, to which the reply was, "Yep...."
The frame is done in flat black with gloss black and silver graphics. Some of the details on the graphics are pretty subtle, but very cool. Other features include Canti bosses and track ends with stainless steel inserts inside and out to protect the aluminum drop outs from being gouged up. Water bottle bosses, seat collar, head set, and hangar for the front brake is included. I won't spill all the beans on exactly what everything looks like and what the arrangements for selling these will be. I'll let the respective marketing departments make their own "official" announcements here. Just consider this a "sneak peek", and look for more soon from your Raleigh dealer and Twin Six. Reviving The Old, Only With Bigger Wheels This Time: I've written about this before. Old models or companies bringing back familiar names from the past only shod with 29 inch wheels. Well, I saw something that took me waaaay back yesterday. In the early 90's, GT Bicycles did a titanium framed XC race machine called the Xixang which was a bike you could buy. There were never many produced, but when you saw the mags every month, there would be Rishi Grewal pounding out some climb on one of these rigs. Now GT brings it back with 29"er wheels. I must say, the Triple Triangle deal never really set my heart a flutter, but the new rig, with the cool curved and tapered titanium head tube looks boss. I sure hope to catch site of one of these sometime just to see if they trip my trigger or not now. At any rate, it is a cool thing to see retro and modern mixed up in a new bike. 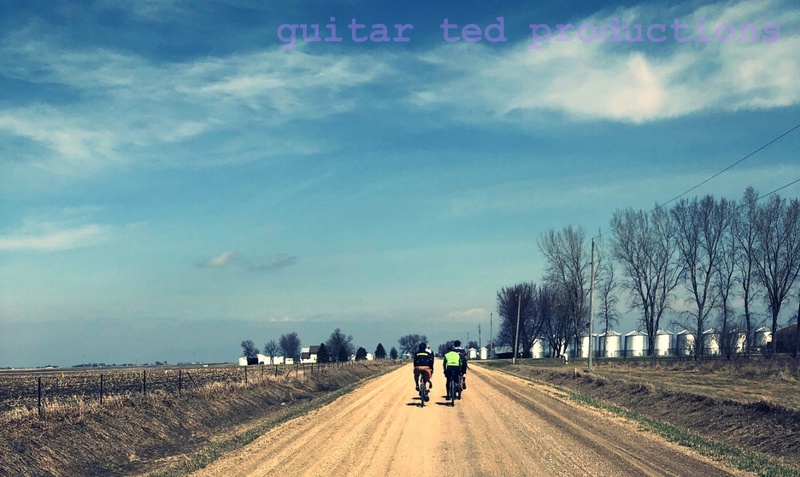 On Wednesday, I needed to do some final checking on a potentially closed B Road in Tama County that is part of the Guitar Ted Death Ride Invitational that happens this Saturday. I decided to take the Snow Dog for the job. Yes- a fat bike. 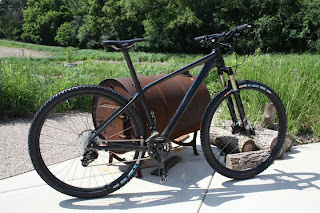 I have an idea that the fat bike might be the best for B Road explorations since B Roads in Iowa can present certain difficulties that normal gravel road riding doesn't. Things like ruts, for example. And not just any ol' ruts either. Another reason I took it was because I might have run into some wet areas, (I didn't), and my thought was to test the bigger tires on the sticky clay. I still have not gotten to do that yet, but that day will come. I did get into some sticky wet gravel the last time I went down this way, and those bulbous tires did alright. Sure did. What I didn't think of was silty dust and sand. Yes, I did run across this and the fat tires were great on it. The best part was that I left minimal impact on the road. Only the little Larry tread block pattern, and nothing more was left by my passing. The next decent gust of wind will hide that in a heart beat. Cool! What is striking me about having the Mukluk is that this just might be the "true all-terrain bike". While it isn't fast, nimble, or probably a choice many would consider at first, (I know I didn't), I think people would be pleasantly surprised by the format's capabilities. While I have not done this, my friend Ben Witt says that the fat bike tires do really well on big rocky terrain where one would normally think of a full suspension mountain bike. I do know that places I thought were "off-limits" due to the difficulty in traversing over the terrain are now sought out because of the fat bike. The floatation of the tires, and bump absorbing qualities come in handy.....most of the time. Sure, the tires and wheels are heavy, and the steering is a bit sluggish, but with the right attitude, one can climb stuff, go over stuff, and have more fun on terrain that challenges a "normal" mountain bike, or stops them dead in their tracks. You work harder going up, but not that much harder. You just gear down, and crawl, instead of powering over,or getting knocked off-line, perhaps. I don't quite know how to put it other than you have to ride these with a whole different attitude than a normal mountain bike, or cross bike on gravel, B Roads, and where ever else you fancy going. That sand bar along the river? You bet. Got a mud bog to cross to get to the other side? Go for it. Snow? Well.....of course! And About That Course: Yeah, well I got turned around and lost for awhile yesterday. (Remember my post about Adventure?) It turned out okay, but in the process I found a stunning gravel road that with a bit of re-routing would be a great addition to the GTDRI course. So.....I'm changing the cues again! I'm sorry, but this road is worth it. It eliminates a chunk of boring, narrow paved blacktop. It climbs the same ridge, but does so in a more serpentine, interesting, and rustic way on gravel. Plus, if we are as lucky as I was Wednesday, we'll spy a zebra. Yes- an honest to goodness zebra. It eliminates about a half mile of pavement overall too. (Well, more if you count riding on the shoulder, and we're going to.) The downside? We'll have to ride on the shoulder of HWY 63 for a mile and a half north out of Toledo. It is a wide, gravel shoulder though, so it shouldn't be an issue. Cyclo-cross season is soon to be upon us, and many folks will be hitting up the shops, websites, and forums looking to find a new rig, or just to geek out on some hardware to get stoked on the season. With that in mind, there are a couple of questions I have in my mind concerning cyclo-cross. I need to put out a bit of a disclaimer here first though. Right up front, I will admit that I don't race cyclo-cross, nor do I care to. Hey, it looks fun and all, don't get me wrong. However, paying to do an hour ride on a course I'll not get to check out again for another year, (maybe), doesn't appeal to me all that much. Just sayin'. I don't hold anything against ya'all that want to compete. Have at 'er folks! I am just curious about the bikes and the marketing of them. My Black Mountain Cycles "Monster Cross"
Clearance Clarence: I see all kinds of marketing done to show the cross guys how much "clearance that frames have for mud", and I have noticed that yes; the forks have a ton of clearance but the frame? Usually not so much. Why? It would seem to my mind that (a) having more mud clearance would be a good thing and that (b) this would open up the user group for any given frame. Bigger tires? No problem. Fenders? Yup! Don't say it can't be done with a road drive train. (Just peek at that Orange Crush rig over there. Gotta road drive train and big tires on it. I could put "legal" sized crosser tires on and have loads of mud clearance.) Maybe I am missing something here, but making cyclo-cross bikes more like skinny tired roadie rigs seems like the wrong way to go. Then again, maybe that's a marketing decision, but I think the commuter, adventure, "ride one bike anywhere" groups are getting the short end of the stick. Especially when you hear the old saw about "how versatile cross bikes are". Not anymore they aren't! Now they are more road, less something else, it would seem. Cross bikes with disc brakes like this Ti Vaya has? Disc Brakes: Now Or Later? A lot is being made of this disc brake thing for cyclo-cross of late. Really? I ask you- Why would any cyclo-crosser put heavier brakes on a bike that may not work much better than a good, well set up cantilever brake? Yeah, yeah...mechanical disc brakes work great. I agree, but I have also seen what wet, nasty, muddy weather- (ie: The kind that seems to be the norm for cyclo-cross races. ), does to these brakes, and it ain't pretty. I wonder then: Do racers wait for "real hydraulic levers" to come out first? (Not the cable actuated, under the stem master cyclinder kludges that I've seen so far) It seems to me that disc brakes and cross are just waiting for SRAM, (most likely), to do the deed and get a drop bar hydraulic "brifter" out there before it takes root. Maybe I am wrong, but I think not. Oh sure, there will be early adopters on the disc brake thing, but this wholesale swap over to disc ain't happening without a true-blue hydro lever/shifter unint. I don't think Shimano will lead the way here, and Campy? Ha! Not likely. SRAM, we're lookin' at you. Well, that's my thoughts, but again, I'm just a casual observer. Adventure: Are You Seeking It, Or Hiding From It? Recently I was on Facebook and saw a post by someone that was musing on "what had happened to the adventure in mountain biking". The Facebook link was getting a lot of great comments. First, about how many felt the author wasn't getting it about "adventure", was being grouchy about the "new school" riders, or how we are actually living in the "golden age" of adventure cycling, and that it never has been better. I say phooey to all of the above. 2.participation in exciting undertakings or enterprises: the spirit of adventure. 3.a bold, usually risky undertaking; hazardous action of uncertain outcome. I will assume that if you come here often, you already know what the term "cycling" means. So, as I read the article about "what ever happened to the adventure of mountain biking?" I read how the author grouses about terminologies, definitions, and segregation of the mountain biking community and what this has done to the spirit of "adventure" in mountain biking today. The Author On T.I.V7 Recon- Always An Adventure! I don't know about you, but I have no idea what I am going to find, experience, or whether or not I'll have a good, bad, or in between outcome most of the times I ride. Yes, really. You know why? Because I expect to find adventure anytime I am riding. If I didn't, I wouldn't ride my bicycle. Sure, you might think riding groomed trails, gravel roads, or commuting might be dull. You might think you could guess with regularity what the outcome of my rides are. But I say, you haven't a clue, pal. Not at all. I have another way of knowing when I am having adventures, and that they are exciting, risky, and that I don't know exactly know how they will turn out while I am having them. It's when Mrs. Guitar Ted thinks about my riding, which drives her nuts some times. Must be risky looking to her, and she doesn't like not knowing the outcome of my "adventures", and especially that I can't tell her what it will be. I don't think "definitions" for your riding or mine preclude you or I from having "adventures". I don't think where we ride precludes us from having "adventures". I do think your attitude, and your expectations can limit your "adventures" though. And in some cases, a lot of folks actually shun adventure. You decide what an "adventure" is on your bicycle. If you were "excited", felt as though you were "taking risks", and if you weren't sure of the outcome, (and really, can we ever be sure of the outcome in life, much less cycling? 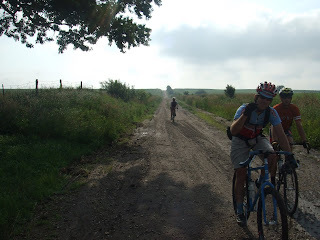 ), then you had an adventure, be it on a mountain bike, a tricycle, or yes, even a recumbent on RAGBRAI. So, whatever happened to the adventure in mountain biking? Easy. It is alive and well in the hearts and souls of those who seek it. It sure ain't limited by someone's definitions, where you ride, or whatever. With the break in the nasty heatwave we had last week, a new weather pattern has set up. Nasty thunderstorms come in, dumping copious amounts of rain in short order. Usually this happens early in the day. Then, the sun comes out, turns the rain sitting on the ground into vapor, and we get a humid, wet, clammy, hot day. Sound like a tropical rain forest? It feels like it, sans the cackling animals, large venomous snakes, and undiscovered cures for cancer. We do have mosquitoes though. That we have in spades. We also have a lot of standing water and mud. So, with the return of the Mukluk and the main mountain biking spots all too wet to ride in the vicinity, I decided to do the "swamp bike thing". Off to the Green Belt. Now, I get chastised from time to time for even dreaming about riding in the mud. One thing I need to make perfectly clear right now: These trails are not negatively affected by riding while they are muddy. The Green Belt follows the unruly, and aptly named, Black Hawk Creek, which churns the black earth and sand together at its whim and fancy. It changes course, chews away embankments, and dumps drifts of the finest sand whenever and wherever it wants to. A biker or two doesn't do anything compared to what the Black Hawk Creek can do all on its own. Multiple times per year, I might add. That said, maybe you shouldn't ride on your wet trails. I'm betting you shouldn't, just like we don't on most of our single track. However; the Green Belt is not one of those places. And I was on a fat bike to top it off. Less impact with the floaty tires. Well, I've been back in here with 26 inch mountain bikes, 29 inch mountain bikes, and I'll tell ya. This fat bike is the vehicle for mud around here. It still sticks to the tires, but in a much thinner coating, and clears off well. Wet mud? Nuthin' doing. It floats right over it. The big, long stretches of 12 inch deep water on the trail was no problem either. I only got sideways crossing a water drenched ravine that was hub deep. Yep. Got wet feet there. Hard to see "the line" through when it is submerged by murky water! Yeah, a lesser mountain bike would have done okay, but wouldn't have been better, and I would have gotten stuck more times, causing more ruts, and what not. (Again, not that it would matter after the next flood, which will come after the next heavy rain.) Sand dunes were easy-peasy. I would have dug right in with a "regular mountain bike". And I suppose some of you were wondering about how the hub is doing? Well........not so good. 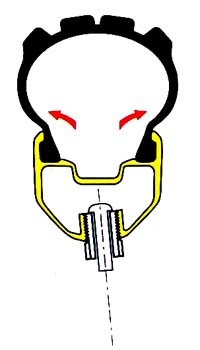 It snaps, pops, and does that after almost every coast, or change in pedal pressure. Sometimes you can ride several minutes with no untoward noises. Then....pop! Snap! I thought I was going batty. I took off the old chain, checked the (nearly) new cassette, the (nearly) new chain rings, and the (nearly) new bottom bracket. All had less than 50-60 miles on them. (Most with Ben's wheel) I replaced the chain anyway, since I had heard of issues with SRAM chains on snow bikes. I put a Wipperman Connex chain on it. No change. Still makes noise. Bummer. It's the hub, again. This time I'll just run it into the ground, cut it out of the wheel, and replace it. It's destined to become an expensive paperweight. But back to all of that green stuff! It was a fun ride. Can't wait to do that again soon. I'll tell ya one thing- These fat bikes really give you a work out! Notice: I did some recon on Saturday and found out a couple of roads were blocked by downed trees and impassable near Toledo. So, I have selected a slightly different route. It adds about a mile of pavement to what was already a mile and a few tenths coming out of Toledo, but there wasn't much I could do about it. If you've made cue sheets already, you should take note of the changes. I also caught a turn I forgot coming into Toledo. I'm pretty stoked about riding the route. It is pretty scenic, and the roads are looking like they should be fun to ride. There will be a mix of hills and rollers. No grueling, killer grade after killer grade, like the last two years, but it should prove to be challenging none the less. No snapping, no popping, no slipping, and nothing a hub shouldn't do. That's a good sign, since the last two times I tried the bike, issues arose after the first ride. The difference? This time Phil Wood & Co. replaced the entire hub. They re-laced the wheel, and then sent it back. Pretty good deal, eh? It would seem so, but for a few pertinent things. First, there is the issue of over five months without a rear wheel for my bicycle. That's a lot of time I can't get back, and that Phil Wood & Co. had my hub in hock, along with my spokes and rim. Secondly, I had to ship the entire wheel back twice on my dime. That wasn't necessarily cheap either. So, is it a bad deal? Well.....yeah, and no. Yes, because the whole thing reflects quite poorly on Phil Wood & Co, and no, because as long as the hub works, I'm good. Yes, it is bad because it cost me more than it should have in time and money, and no, because I don't have to look for another rear hub, and build up another rear wheel. It is difficult for me to feel good about Phil Wood & Co. but I won't go out of my way to dissuade anyone from buying their products. Maybe my situation is an odd one. It would seem so. I hope, for their sake and the sake of their customers in the future, that they treat their warranty issues with a bit more communicativeness and with as little pain to the customer in terms of time and money than they did with me. Paint Us Black: I've come across a couple troubling media stories concerning cyclists of late. Some "headlines" of sorts, that make me feel a bit concerned. So, these derogatory headlines about cyclists. They are not good, because really- most folks will rarely read the entire article. More policing of maniacs on two wheels brings hope to city drivers"
And this isn't limited to news print media either. Recently I read about two radio disc jockeys that announced a program saying they were going to discuss "these cyclists who are like a religious cult". Master Frame Builder Ishigaki-san started the Toyo Frame Company in Japan in the 1970's The factory went on to produce some classic BMX bicycles and mountain bikes early on, and also does work for Rivendell Bikes. If you've got time to slow down and read something, (hint! 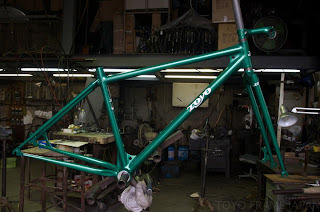 ), check out this story on the Frame Builder's Forum about Ishigaki-san and Toyo. 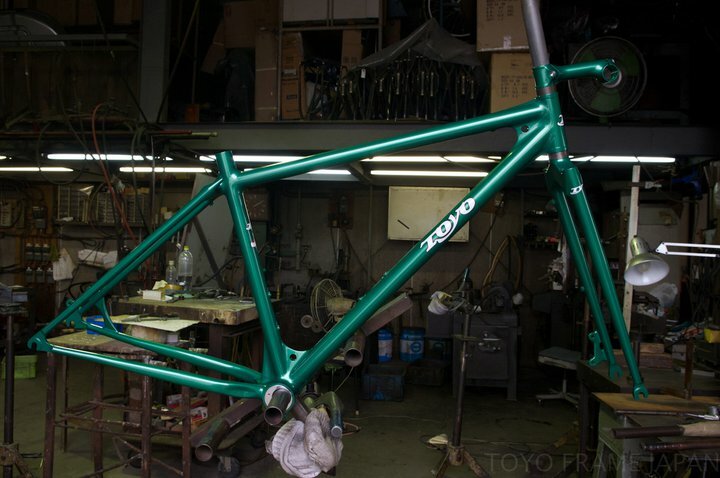 I was pointed to Toyo's Facebook page and saw this awesome, beautiful rigid 29"er that happens to be joined in my favorite technique, (fillet brazed), and in one of my all-time favorite colors. You should go through the Facebook album of this bike, where detailed photos show the bare frame, and you really get a sense of the skill and efforts that went into this beauty of a 29"er. Now, I'm not one to get all wobbly-kneed about the "artistry" that many frame builders claim to have, because many are just fancy paint jobs over "good work", not necessarily "art". However; I do think that it can happen where "art" and a bicycle frame come together, and this one is a fine example. Maybe the most outstanding fillet brazed bike frame I've been made aware of. Enjoy! Also, the GTDRI site has a link in the right hand margin for the 2011 Cues. If you are coming, get these printed off if you want cues. I won't be bringing extras! Once again, we'll be heading out of Hickory Hills County Park in Tama County. Have a great weekend! Take pictures! Ride yer bikes! Yesterday was a test ride day and I didn't waste much time in hitting up the Camp's South Side early in the day. With the recent heat wave, getting out early is the best ticket for getting in a couple good laps. In fact, I probably waited a bit too long. By the time I was done, it was past 11:00am, and the woods were already sapped of the cooler night air that was still around when I started out riding. July 31st is the big XC race out here and just about everything looks good to go. There is one good sized tree that snapped off about half way up, and smashed a couple of others, making one part of the single track impassable on your bike. I'm sure that will be addressed come race time. Otherwise, the trails are fast. Really fast. If it doesn't rain much ahead of the event, I'd expect a super fast paced event. The newer sections added since last year only enhance flow, and thus speed, so be careful! It is easy to overcook a corner that comes up faster than you can see it when going lights out now. Of course, I'll just be getting back from the GTDRI that day, otherwise I'd be in attendance for this one. If I were coming, I'd choose an efficient FS rig over the hard tail, but that's just me. I think the full suspension opens up a couple of more lines, and smooths out some of the rougher stuff out there that slows you down on the hard tail. So that's my tip on the course. Whoever lines up for this one will have fun. It is a great course now. Just hope it isn't quite so hot the day of the races! The Guitar Ted Death Ride Invitational will be taking off on July 30th from Hickory Hills County Park. 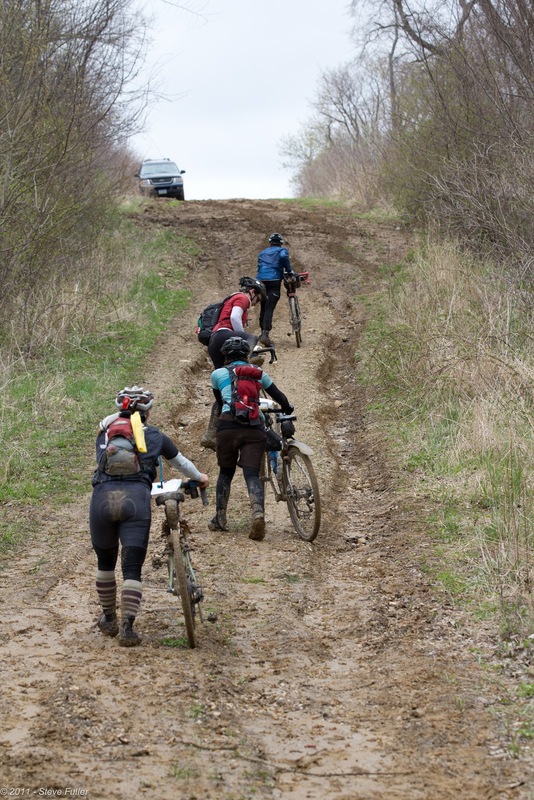 As you all know that are interested, this is essentially a "no rider left behind" type, gravel group ride. 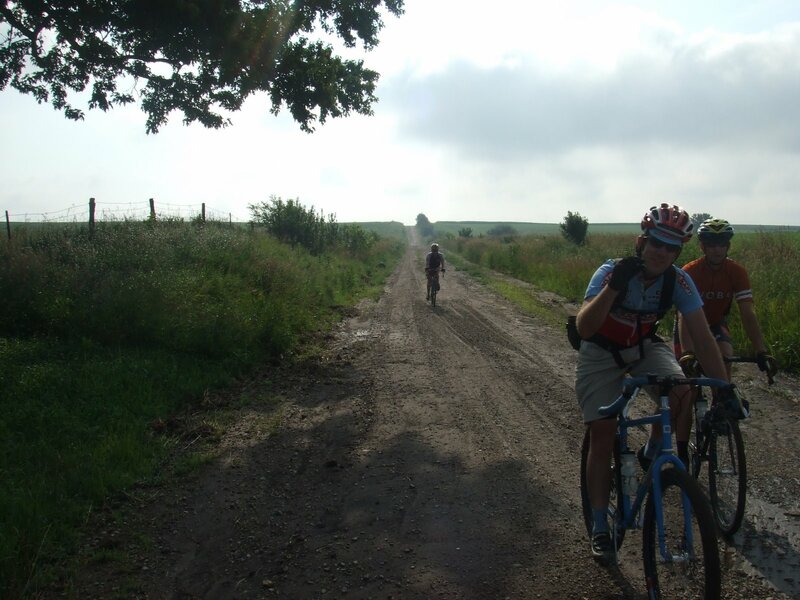 It will cover approximately 102 miles of mostly Tama County gravel. A couple of points I wanted to make about the ride; First, it is free, and self-supported. We'll be going through towns at Mile 20 and Mile 60 where you'll be able to supply yourself for the gravelly goodness. No sag. No "bail out" plan provided. You are responsible for yourself. Secondly, one of the folks that has committed to attending has decided he wants to bring everyone cookies for munching on. I suppose you could call them "Death Ride Cookies"! Well, in order to help this fella out, can we get a "roll call" of people thinking about attending, so he knows approximately how many cookies to bring. Just hit the comments section for this, and I'll forward on the number to him. The Belt, or The Chain: I just posted a new write up on Gates Carbon Drive Center Track here, which you can read. In it, I discuss the good, bad, and the ugly about the new version of "The Belt". Short version: I like Center Track. It is all "gee-whiz", cool factor, and high performance wrapped up in a carbon embedded belt that looks like it came off a '72 Chevelle street rod. (In fact, if it whirred like a supercharger, it would be off the charts rad.) The thing is, it costs like a custom part off that '72 Chevelle street rod, and still doesn't have a lot of choices, or a good way for anybody to tension the belt with any certainty. The Smart Money Is On: Later. Why? Because there may be too many made, and the market may not support that. Plus, who knows about some of these, whether they will ride well, have decent tire clearance, or be single speed-able. (That last one was a joke, kind of.....well, maybe not!) Market forces and availability, decent performance, single speed, or no....too many questions. Get an established brands bike with a few years under their belt? Sure, otherwise, I'd wait and see what happens. Might be advantageous. Thru-Axles, Tapered Steer Tubes, Dropper Posts- Yes Or No? You've got some serious choices to make in the coming months and years. Wheels, forks, and even seat posts will be forever changed by what is happening in the technical areas of mountain bikes in general, and 29"ers in particular. 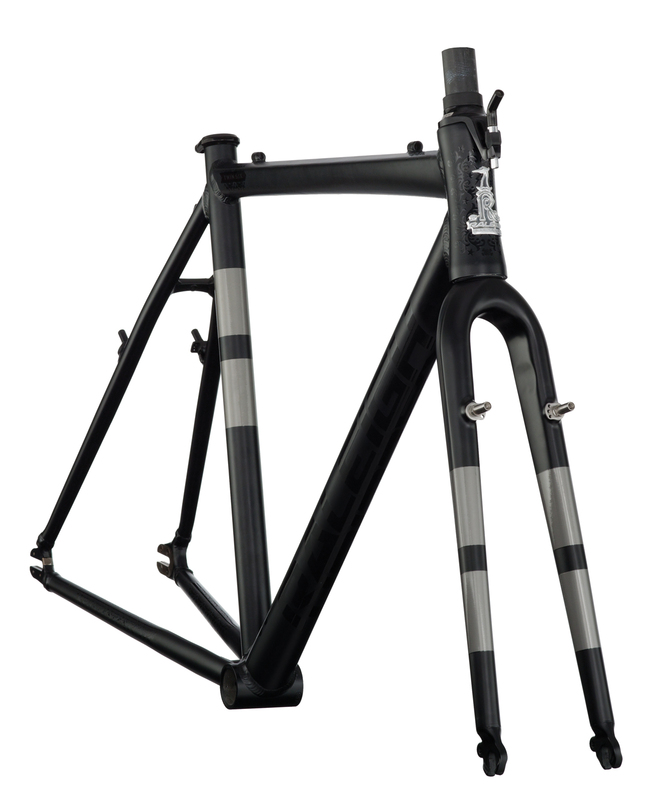 Frame compatibility with these parts will force some decisions, and sooner than you think. The Smart Money Is On: Yes Why? Because (1) Quick Releases for mountain bikes, and particularly 29"ers, are dead. Get wheels that have thru-axle capability front and rear now, or be sorry later. 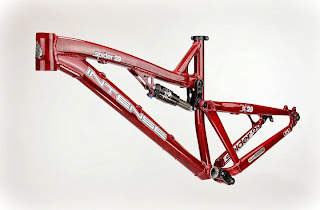 (2) Forks will be mostly tapered steer tube models, especially for 29"ers and longer travel mtb bikes in general. May as well get on that train now. (3) Get a dropper seat post. You don't know you need one, but you do, and the FS frames of the future will all be routed for them. Go ahead. Buy one, use it, and tell me I'm wrong. The Smart Money Is On: Now Why? Because almost every wheel that comes out from here on out will have some sort of proven way to be made tubeless, and the benefits far outweigh the negatives. Like my old boss at the car repair garage, who was floored back in 1997 when I told him bicycles still used tubes, we should all be just as flabbergasted in the coming years if we meet a mountain biker that still is using tubes in his tires. Ditch the tubes now folks. There is no debate any longer that tubeless is safe and easy, and the way of the future. Gee, how many times have you heard "Hot e'nuff for ya?" lately? I can't count the times. Just in case you forgot, this was the weather you begged for in the depths of winter when you were covered in snow, shoveling the drive, freezing your bits off. Yeah, a "real summer" has struck the Mid-West and you'd think folks had just moved here from north of the Arctic Circle. Weird. Don't get me wrong. It is really hot out there. With the humidity high and the air temperatures in the 90's and touching triple digits in places, you'd better believe it is dangerous to just nonchalantly go about your normal business with no regard to the weather now. But the same goes for winter time as well. No news here. I work in an air conditioned shop, and with recent developments being what they are, we actually get to use the air conditioning now. So, when I left work after my shift yesterday, I hadn't considered a couple of things about that fact. I went for a ride to Hartman Reserve to try out the Gates Carbon Drive and Maxxis Ikon tires I am checking into. I did a little fast riding, and then stopped to cool down, and snap off a few images with my Panasonic LX-3. I pop of the lens cover, fire up the thing, and as I do a lot, just pointed the thing at my subject and fired off a shot. You know, I can always just delete it, and you never know if it'll be good or not. I think that is fun. Just like lining up a shot, selecting your parameters, and composing a good shot is fun, only in a different way. I do that too, but I like surprises with photography, so just randomly firing off shots, yeah. I do that. So sue me. I never said I was a photographer, right? Some "serious" photogs are probably shaking their heads in disgust right about now. Frankly, that is their problem. I'm having fun. Well, I look at the image I get and think, "What the....!!" I turn the camera around and see the condensation. Ha! Oh well. I worked with the image anyway and got what I posted here today. It is just a weird looking image, but I think it portrays the soupy air feeling I had out there today rather well. Your mileage may vary. So, what's the point? It is hot. Yup! Thank you very much, Mr. Obvious. Now, take what you got, be thankful it isn't worse, and have some fun with it already. Before long you all will be freezing, shivering messes with the Fall weather that is coming right around the corner. Get out and ride. Be careful. Get rad! Big Wheels, Little Wheels, It Doesn't Matter- Or Does It? Recently a new issue of Bicycle Quarterly came out. Now some may not think this quaint looking paper rag has much to offer. Maybe you've taken a peek and thought it was some off shoot of the old "retro-grouch" thing. Maybe you think it is just a denizen of 650B freaks and rando nut jobs. Well, it is, but it is a lot more than this. The publication is pretty much the "bike geeks geek rag". It doesn't get much more "pointy-headed" and "pocket-protector-like" than "Bicycle Quarterly" for North American bicycle enthusiasts. They do experiments and tests that you'll never see in "Velo Ne....." whoops! I mean, "Velo", or in the glossy pages of "Bicycling", no matter how many times they re-do their formats or change editors. Nope. Not even close. Why Use A 29" Wheel? But you might say, "Well okay, but what about off-road?" They thought about that too. While they did not do any off road testing with 29"er wheels vs. other sizes, they did theorize that the "angle of attack" thing was so statistically small it was probably also insignificant off road. So, why ride a 29"er wheel at all? Good question, and one I think this test inadvertently supports in the affirmative. You see, part of the testing they did was to fit the bicycle they used with an SRM power measuring crankset. According to their findings, it took basically the same amount of power, (within their standard for accounting for "statistical noise"), for any of the wheel sizes to be powered across their rumble strip test road. This tells me that one of the criticisms of 29 inch wheels isn't all that true, and possibly doesn't matter at all- that is the criticism that 29"er wheels take more energy to move than smaller sizes. Interestingly, the Editor's post to lead off the latest issue of "Bicycling Quarterly" talks about the "subjective feel" versus the "objective findings" that some testing/reviews feature. In the terms of "subjective feel", I think 29 inch wheels have the advantage, but I also think there is a good reason for that. The testing on wheel size did not account for geometry, and did not account for fat tires at lower pressures. On a 29"er, the rider is in a different relationship to the axles than on a smaller wheeled bike. The testers at "Bicycling Quarterly" actually touch on this subject in terms of handling, but do not reference geometry specifically. The differences in handling play a huge role in why I happen to appreciate 29"ers. Then there is the fat tire thing. Early on, some 29"er folks did some random testing of tire contact patches versus 26 inch wheeled bikes. Using similar tread patterns, and similar pressures, the contact patches were predictably the same area, but not the same shape. Obviously, it wasn't a huge difference, but in the area of how our tires touch and react to the trail, any differences are big, and I posit, can be felt. Traction and cornering is noticeably different on a 29"er versus smaller wheel sizes, and this is another reason to want to use a 29"er for trail riding. At least I think it works better, and so do others. It also has to be said that designers of 29"ers are finding that the bigger wheel size demands its own, specific design characteristics. Suspension, tires, and wheels are all things that are or have been re-thought and made better due to the emergence of the 29"er. Not to mention the ever changing geometry of big wheelers, which is still being honed to this day. If wheel size didn't make a difference, then one has to wonder "why bother?" Obviously, something is going on beyond power measurement over rough grounds here. And that is part of the conclusions reached by the "Bicycle Quarterly" piece. Obviously subjective feel on the part of the rider is an important factor. So, I would encourage you to try a 29"er if you haven't. It isn't for everybody, but it might just work for you. Okay, I slapped the Ergon PC2-L's on the Xtracycle and on Saturday I spent several hours pedaling around on them. Here's my take. If you want to read up on the techy stuff, see my introduction to these peds here and here. Well, with pedaling the Xtracycle with and without a load, the shoes and pedals never felt bad in any way. Plus, I looked stylish off the bike. (Ha! Maybe you wouldn't think so....) Well, it was pretty fun just to not have to wear a cycling specific shoe, and still have an efficient, comfortable connection with the bicycle all day. Ergon claims other benefits, like less complaints of knee pain, and better power transfer. Can't say as I can refute those claims. I definitely felt as though I was getting the power laid down just fine. Knee pain? None here, just tired after all that pedaling around. As it should be. First, if you are a commuter, or if you have a utility bike sitting around, you can ditch the cycling shoes with the PC2's. Really. You won't miss them. You'll use the bike more if you can just hop on and go, instead of swapping shoes out before and after you ride. Secondly, for folks just getting into commuting, or utility cycling, this means that instead of spending money for pedals and shoes for cycling, they now can save money, and just use the shoes they have already. The real bonus is that either way, you will still have an efficient, good fitting, and comfortable shoe/pedal interface. It should also be noted that the PC2 makes a smarter upgrade from clips and straps, (or whatever cheesy stock pedals came with your bicycle), for the same reasons. But that niggling question about long term use is still hanging out there. These are far too new to the market to say one way or the other, but I will continue to put the PC2's through their paces in the coming months to find out. Spy Optics Performance Eyewear: Here ya go, another eyewear test! This time, it's from a company maybe better known for their goggles than glasses. (Jeremy McGrath is a part owner in Spy Optics, for example) That said, Spy Optics wants to branch out into the performance sector again, and if you go to their site, you'll find a mostly "lifestyle" type look and feel that isn't necessarily what we cyclists would find all that welcoming.....let's just say it that way, for looking at what we want in eyewear. Well, Spy Optics can figure out the marketing, but as far as eyewear goes, they have the technology and performance down pat. You can read my detailed review on The Cyclistsite here. I will say here that these glasses are super comfortable, super high performance, and are on par with the high end name brands in cycling we are familiar with. Very much on par, maybe better. Cyclists will dig the full coverage, semi-frame construction, and the anti-fogging design. My samples were polarized too, which cuts way down on glare on hot, sunlit days. There are several frame colors and lens choices too. They have anti-scratch and anti-moisture treatments on the lenses as well. Fully optimized lens technology for vision here. No distortion and on par with the best in the business as far as that goes. Worth wading through the culture there to find these, if you want something different than the mainstream brands in cycling, for sure. I give these my recommendo. Disclaimer: The Spy Optics eyewear was submitted to us at The Cyclist at no charge for review. I was not bribed or paid to write this post. I strive to give my honest opinions throughout. I told them to do that straight away last time it went back, by the way. Appears that their "Head Engineer" agreed....... finally. Good. Now assuming the wheel is built, and correctly, I should be getting The Snow Dog back together again by next weekend. Just down a wee bit and to the right! Guitar Ted Death Ride Invitational: As per my post yesterday, you will note that I did recon some of the upcoming GTDRI route. I am excited about a couple of the roads. One in particular is just past the corner where I shot the image here looking down to the north. I sure hope it doesn't rain, because it is a B Maintenance road that, while not as gnarly as the one on T.I.V7, is pretty dang rad. It is mostly clay, highly crowned, and has a steep drop down to a gentler downhill. It looked wet when I rode it Wednesday, and knowing how slippery-snotty clay can get, I eased into the down hill with trepidation and great caution, lest I fall and slide off into a 20 foot deep ditch to the outside of the bench cut roadway. Well, it was just tacky, but, ya never know! So, How About That There Belt-thingy? : I did get a brief ride on the Gates Carbon Drive Center Track system Wednesday too. Readers might recall that tensioning the system requires getting the belt to produce a tone in the 70-85Hz range. That turns out to be approximately a D# on the bass clef. Who knew? Well, I had it pretty tight already, (tuned to approximately an A), so I rode it anyway. After a while out at The Camp, I felt pretty confident in mashing up steeps on it, and it held up well. The best part? The tension I used allowed the cranks to spin approximately as easily as a chain. The bad part? I didn't get the spacers right on the freehub! (jingle-jangle) Oh well..... More to come, but this looks to be more promising from a purely performance standpoint than the older system. The only bummers about it, and likely to remain so, are the availability of combinations that would yield a desired "virtual chainstay length", and costs. I Wasn't Expecting Much: Ergon has been working on some things for a while, one of which was some pedals. That much I knew about some time ago. I figured they would be mountain biking pedals of some sort, and figured they would be some time in coming. However; I wasn't ready for the news that these would be commuter pedals. I also wasn't expecting too much. I mean, flat pedals have been done to death. These would have to be something pretty cool to raise my eyebrows at all. Well, Topeak-Ergon man, Jeff Kerkove invited me to try a pair out recently. So they hit the door yesterday and looky here! They are different than I thought they could be. Very different. My first impression is that they are large. Really, they are pretty big pedals. A bit larger than most free ride flats even. They are also contoured to fit the curvature of the bottom of a shoe/foot combination. For instance, my Vans sit in these like they were custom made for them. The rough surface is a material from 3M, and is grippy on the soles of my Vans too. 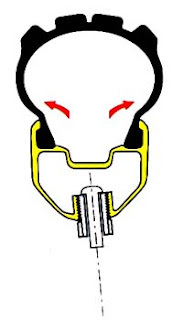 There are no aggressive pins, teeth, or other protuberances on these pedals to scar you. The contours are smooth and friendly. Good stuff for those times when you nick a pedal while walking your bike, or are moving it about. (Especially so if you slip a foot off while riding, although I seriously doubt that will happen with that 3M material there and with the way these are contoured.) These also have the most mondo reflectors I've yet seen on any pedal, and they are integrated into the design. By the way, please do not ask if they are toe-strap compatible. Just. Don't. Ask. Toe straps are eee-ville! Eee-ville I say! First Impressions: I slapped these pedals on the Schwinn Xtracycle rig, and went down to get a case of soda for my lady, and a bottle of Fat Tire Ale for myself. I noticed right off that my feet hit the Ergon PC2's just right. No positioning, then re-positioning needed to find a "sweet spot" The whole pedal just feels the way it should. The concave contouring works. Then again, we've seen some of this concave contouring on higher end mtb flats, haven't we? The PC2 does it one better for commuters. I felt like I could do anything I wanted with these within the realms of flat pedals, even without having any pins. The big ol' platform cradled my feet and spread out the load put on them by pedaling. I think these are going to be good. We'll see about that later...... For now, I am well impressed, and I didn't think I would be all that much. Okay, hope you all have a great weekend. Get out and ride! Well, I would have a lot to share with you all today. Things like the new Chris King Ceramic Bottom Bracket, the route details I discovered yesterday for the Guitar Ted Death Ride Invitational, my experiences using the Gates Carbon Drive Center Track, and more, but I have to share with you what happened Monday night, and how it impacted me on my ride yesterday. The rest can wait. I was reconning the upcoming GTDRI event, and decided to drive down to Traer, Iowa to start from there. I went south on P Avenue, and headed for that old, familiar stretch of B Maintenance road I have ridden several times, has been used in past GTDRI's, and that has been on two Trans Iowa courses. Yes, I know the road well. I saw a couple of trees snapped off and some folks fixing some utility wires on a farm, but thought nothing of it. I approached the section of B Road, and looked off up the road. Oddly, something didn't seem quite right. I couldn't quite put my finger on what it was though. It had been well over a year since I had been down here though, so, who knows? Well, I got to the lowest part of the road, where it used to cross over a stream, and I saw that a new, low water crossing had been laid out. Okay, that's what it is then. But I still couldn't shake the feeling that it was something else. Something here didn't line up with my memories of this spot. It dawned on me when I crossed the new low water crossing what was wrong. The farm up on the hill ahead to the right of the road was mostly gone! Where there used to be the profiles of several outbuildings, there was something misshapen. I had a queer feeling arise in the pit of my gut. As I rode up the hill, a large evergreen tree that used to stand alongside the road blocked my further passage. Machinery could be heard from the other side. As I dismounted to work my way through the ditch, and around the fallen tree, which was so massive it obscured my view of the farm, I could see broken bits of wood, sheet metal torn and twisted, and bits of insulation on the damp ground. As I rounded the corner, I saw the devastation. The farm was mostly destroyed, and the roof of the house had a blue tarp stretched over it, which was bulging upwards in the wind like some twisted version of Jiffy-Pop popcorn. Only ugly, and distasteful, and sickening. I thought, "tornado", and rode on, only to find more devastation on almost every farm I saw. For miles. This was not the work of a tornado. It was worse. I didn't know what had happened. I hadn't heard a whit about this event down here. I rode on in shock and felt terrible about being a guy having a good day on a bike while so many peoples lives lay twisted and torn in heaps and piles all throughout this part of Tama County. The feelings didn't go away as I rode through Clutier, a town on my planned route, which had all roads closed going into it, and looked as if a bomb had been dropped on it. In the town, lots of folks were busy working to clear up the mess. In the distance smoke from fires could be seen, evidence of folks burning debris from the weather event's damage. As I turned back northward to Traer, I saw miles and miles of downed power lines, and even had to dodge several low hanging poles over the roadway. In some cases, the poles and wires had been blown halfway into the fields lining the road. When I got home, I looked up what had happened. Surprisingly, little has been said or written about this. Apparently, Garrison, Iowa, the little town on T.I.V7 received very intense wind damage. Some fields I saw were pretty battered, with corn beaten up to the point I think it may not yeild anything, but some fields apparently were flattened to the ground. What did this? It was a "Derecho", which is an event connected to severe thunderstorms that produces high speed straight line winds. In Benton County, the estimates were that the winds were 100-130mph. Yeah, that'd do what I saw. Now I know. I've never seen anything like it in Iowa on such a widespread scale. I hope I never do again. Okay, after some waiting, I have finally procured the belt that will work with the length of the chain stay, the cog, and the front ring that are on the Sawyer. The Center Track system is alive! My issues with getting a belt to fit also pointed out some other irregularities that may plague some designs out there. The sliders on the Sawyer, which have a ton of "throw", arc throughout their travel. Okay, now stop and think about that for a minute: Those sliders have to travel in the exact same arc on either side, or you will notice "oddities" with regard to your rear wheel placement within the frame. This manifested itself to me when I tried fitting the first, too short, belt. The sliders were off enough from side to side in terms of the arc they traveled in that the wheel was almost slammed over to the non-drive side in the front, near the bottom bracket. At the seat stays, it was barely noticeable. As the sliders traveled backward, the arcs traveled by the sliders matched more closely, then at the end of the throw, were only slightly off to where the adjuster for the non-driveside is out more than the driveside adjuster, which is nearly buried into the drop out. Notice the adjusters? One is out further. I'm okay with it. I got the wheel centered, but with sliders, I've noticed these sorts of issues before. They don't have to have arced slots to be off either. I've seen out of plane sliders on several bikes. Custom ones even. This is about Center Track. I think t's going to be good, or at least better than the older design, in terms of tension on the system. My contact at Gates said that Center Track isn't so much about "less tension" than it is about not having to use "excessive tension" to make it work. He recommended that I use the iPhone app that is made for tensioning the Center Track belt, which should resonate at between 70-80Hz. Okay......what if you do not own an iPhone? Not a problem......if you are a musician! Looks like I'll be busting out the chromatic tuner and going for approximately a D#. We'll see how that goes, and then test it out on the trails with a report to come later. I was just made aware of another drop bar for off-road. It comes from the company that pretty much helped kick off the whole off-road drop bar scene in the 80's- Nitto. Nitto was the maker of a few of the well known drop bars used on mtb's back then, including the "Dirt Drop", a model whose name has been appropriated to mean any drop bar with flare and/or sweep meant for off roading. 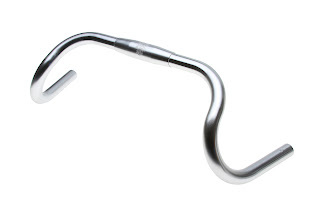 There is also another, similar Nitto bar still available called the RM-13, which has less flare and sweep. (Think Cowbell-ish) However; it is the RM-14 which has caught my eye. It is silver, for one thing, and that in itself makes it interesting. However, it also is made with a 31.8mm clamp diameter, which should beef the bar up a bit for rougher handling. I want to add this into my off-road drop bar comparo. It isn't a cheap bar, retailing at almost $90.00. That may put some off, but since Nitto bars are the "real deal" in off-road drops, and the finish quality is typically second to none, I think it may be an interesting addition to the mix. Redefining "Fat Bike": Surly is at their best when they push the boundaries of what folks think about bicycles, their uses, and in their insistence that everything be made from 4130 ChroMoly and have single speed compatibility. Their first bike, in the late '90's, the "1X1 Rat Ride", was a slap in the face to the industry that had wholly adopted aluminum frame construction and geared mountain bikes. Then they threw out the Cross Check, a cyclo-cross bike, fer cryin' out loud, looooong before "cross was cool". Things continued with the first affordable 29"er frame and fork, the Karate Monkey, then they put out the first real, workable, widely available cargo bike, the Big Dummy, and of course, revolutionized winter biking with their Pugsley fat bike. Now that fat biking has graduated to an all year long pursuit, and several other companies have upped the ante, Surly has taken the chance to basically "one-up" everyone. Welcome to the "Moonlander". What is it? Well, it is a steel frame that will have 4.5 inch wide tires mounted to it, that's what. Major floatation. Surly says: "The very wide rims and very large tires, as you might expect, make for amazing traction, floatation, and minimal ground impact. " The rims will be called "Clownshoe" rims and will be 100mm wide. The tire will be similar to the 3.8" Larry tire, but will be called the "Big Fat Larry", most appropriately, I should say. Single speed? Yup. Same drop outs as the Pugsley, so going with one gear or an internally geared hub can be done as well. Good ol' Surly! At any rate, I will definitely be taking a very close look at the Moonlander at Interbike! I thought about ranting on the gubmints suggestions to cut spending for bicycle infrastructure and alternative transportation, but I figure that no matter what they do, I'm gonna ride my bicycle. So, instead of getting all worked up about that, I went for a ride out on the gravel. One bike, One speed, Open road. You know, I just figured I would go out for a nice spin on the gravel. It's nearly always vacant, and folks out here will actually wave at you and smile, for the most part. So, I wheeled along the rollers and went where ever I pleased. It was hot, humid, and I just stuck it on a steady pace. I felt pretty dang good too. I have to admit, that surprised me. Wild flowers are out now in droves. I will always appreciate summer because flowers are one of my favorite things about this time of the year out on the gravel roads. I picked these roads to ride now because I know there will be flowers. It was one of those days when any breath of wind was greatly appreciated. In fact, the breezes were really quite nice. However; when they died down from time to time, you could feel the heat press in around you. I went by an old farm house I really like. It sits up on a grassy, tree lined knoll and has a great view of the land to the east. It just seems attractive to me, although it is absolutely enormous. Way more house than I would ever need! It's fun to find these cool old homes out in the country. I decided to stop a bit at the corner of Big Rock Road and Sage Road. Yep! There is a big rock here. An enormous erratic sits right on the corner, like it was planted there on purpose. What is amazing is that its position just happened to be where the surveyors laid out corner on the original grid for this part of Iowa. Well, I ended up getting about two hours in of sweaty, steady single speeding. I was pretty pumped to find out that Saturday and Sunday's riding had no ill effect upon the knee. I think I am over 90% on it, maybe 95+% of normal or slightly better. That's good. I still can not kneel on it, and it feels tender right in the middle of the knee cap if I push down on it, but hey! It works yet, and I'm getting around just fine. There. That was much better than some ol' rant now, wasn't it? Hope ya'all had a great weekend too. Pro Road Cycling: The New Blood Sport? The Next Thing On The "To-Do List"